As a word lover, I’m crazy about the 100 Words Series produced by American Heritage Dictionary. I must not be alone either, since my previous two posts, on The 100 Words Every Middle Schooler Should Know and The 100 Words Every High School Graduate Should Know, are among my most visited. 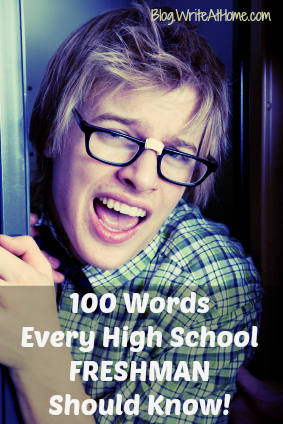 So, here’s post #3, on their book titled 100 Words Every High School Freshman Should Know. As with the other lists, these words are arbitrarily selected by the folks at American-Heritage. If you are, or have been, a high school freshman and don’t know some of them, don’t feel too bad. Just look at it as an opportunity to expand your vocabulary. Also as with the other lists, I’ve linked each word to its definition so you can check your knowledge. If you’d like to take the free quiz (on all 100 words) click HERE. Make a blogger’s day. Leave a comment in the space below. I know half and half. As a high school senior, i never really had great english teachers. That’s why I dont havr rich vocabulary that i wish i had. Definitely gonna start studying words to enhance my writing. I like to write, and i need better words. Mainly for scholarship essays. I have a son currently in 8th grade (homeschool). If I remember, I’ll have him take the quiz and see how he does! He’s an avid reader so I think he’ll do well, but this has me curious whether he really knows the word’s meaning or just guesses using context clues. Let us know how he does! As a high school sophomore, I know a lot of the words on this list! 🙂 a few of my favorite words that should be more well known are parsimony, sycophant, aberration, altercation and euphemism! PS have you heard of Marie’s Words? It is a set of 550 visual vocabulary words. Super fun way to learn words. Good for you, Samantha! Those are great words. I’ll check out Marie’s Words. Hadn’t heard of it before. Please double check your definitions. Most are great! However, there are a few that need adjustment. For example, solstice is about the position of the poles. Each solstice, one of the poles is at its closest, and one at its farthest, angle in relation to the sun. The equator is closer to the sun on one solstice, and farther on the other, because of the elliptical orbit of the Earth. There were a couple of others but I just puzzled and moved on at those, so I’m not sure which words they were. Another though, was “technique,’ which is a process, device, or mechanism used by anyone in accomplishing a task, not just in education. Also, the one I “missed,” which was ‘deign,” I was right on… it means to do something beneath one’s dignity, and you have it defined as to regard as or consider. If I am to share this with others, I’d like to share something that is correct in all its components. I praise and laud your efforts in doing this! I assume you are talking about the quiz answers, Michelle? I have double checked all the answers you refer to. They are all correct and based directly on the given definitions in the American Heritage Dictionary. We have had some complaints that some questions get marked wrong when the test-taker selected the correct answer. This is an issue with Polldaddy, the company we use for creating out quizzes. I am attempting to find out why this seems to be a regular issue and get it resolved. Thanks for taking the time to point out your concerns. As a high school English teacher, I totally agree that kids should know these words and MORE!! Thank you for posting something so worthwhile. Thanks for linking to a quiz, it always adds competition at my house. Sorry about that, vn. I tested it myself and the same thing happened on two answers. I will look into it with the company I use for the quizzes. Did you by any chance take the quiz on a smart phone or tablet? Fun 🙂 Although your test rearranges the responses and marks wrong! 6 words that I know perfectly well were marked as incorrect and suggested that I had selected the wrong answer (which I didn’t). Don’t know if you want to run through that yourself to check. In a world that is seemingly less intelligent every day, it is nice to see a list of words like this. I’m planning on running through them with my kids, who will no doubt also do well 🙂 They read!